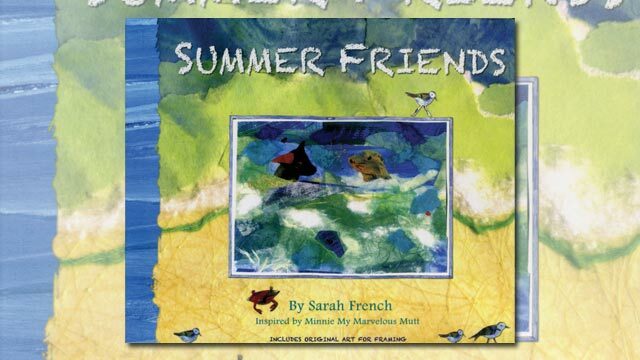 “Summer Friends” written and illustrated by Sarah French. Vineyard Stories, 2011, 32 pp., $17.95. Kids are especially fond of books about friendships — and the weirder the better. Children’s literature is full of friendship bonds forged between unlikely pairs: Frog and Toad, Pooh Bear and Piglet, Lion and Mouse, Charlotte the spider and Wilbur the pig, and, though it’s not a book, Lilo and Stitch. And the Internet brings us photographs of similarly unlikely real life friendships: cheetahs and a tiny antelope, dogs and cats, cat and mouse, etc. Friendship is a form of love, and the sooner one creature learns to love another, the better life will be. “Summer Friends” is a story about such a relationship, based on the Vineyard. 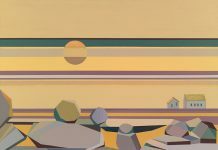 Sarah French, Chilmark summer resident, is a painter and collage artist. She says the book was inspired by daily summer beach walks with the dog she calls Minnie My Marvelous Mutt, who became the main character and part of a friendship. The book is based on a series of actual encounters on the beach between Minnie and a seal. Ms. French conceived her work in the form of a hand-made and hand-sewn book, before it was printed. Her style of collage and pastels is friendly to the eyes and intriguing to the mind of a child, who can visualize magic in everyday scenes. 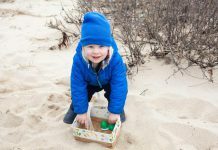 Young readers may all but feel the interface of surf and sand and appreciate the other denizens of Ms. French’s world — seabirds, crabs, fish. In the book, the dog bounces onto the beach and a seal appears. Minnie tries to swim like the seal but cannot swim underwater. Then the dog chases birds but the seal cannot run. It’s a common problem for kids meeting a new friend. What can they do together? They find a surprising solution and create something together, then relax, satisfied. A lesson learned. In practical terms and worth remembering while reading this charming book, some wild creatures may become friendly, but the human, would-be friend will want to wait for the animal to make the first friendly overture. Book Signing with Sarah French, Friday, July 29, 5–7 pm, Dragonfly Fine Arts Gallery, Oak Bluffs. Free. 508-693-8877.